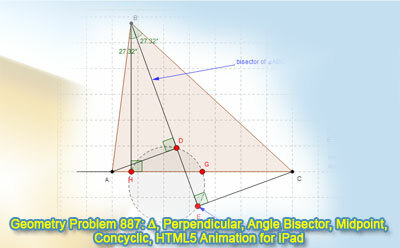 GeoGebra Dynamic Geometry Problem 887: Triangle, Altitude, Angle Bisector, Perpendicular, Midpoint, Concyclic Points. HTML5 Animation for Tablets (iPad, Nexus), Mathematics Education. Distance learning. In a triangle ABC, BH is the altitude, AD and CE are perpendicular to the bisector of angle ABC. If G is the midpoint of AC, prove that E, G, D, H are concyclic points.